There are several things at fault in these circumstances. 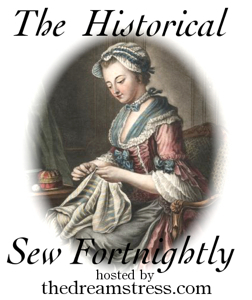 First, I joined the Historical Sewing Fortnightly, hosted by Leimomi Oakes at The Dreamtress. Which in itself sounds like a really cool idea. Chances to sew things for fun and specific purposes. But the projects only last two weeks, and us nutcases, specifically me, can get a bit carried away with what we are planning. So far I had kind of a cop out. I thought I could finish this snood I started but then I got pissy and went against the plan (and decided I wanted silk). So I only finished the gold braid - which will eventually grace the new snood, as soon as I get silk. I know, not the world's greatest shot. This is what happens when Lover is at rehearsal and you really want costume pics. I made the stays out of muslin and reed boning. Based off the Simplicity Pattern 4052. I didn't have the directions so I made it up as I went. 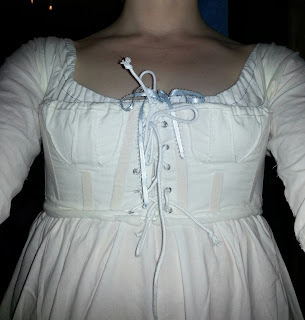 I didn't make a new shift due to the time restraint and the overall lack of suitable fabric. I don't have any pics of the petticoat yet. The gown planned to go over is a green drop front dress made of aged fabric (old sheets), and a heavier brown apron. It's a work dress and I promise there will be pics. Next post shall cover more of the new distractions and hopefully more project pics and obviously plotting. An Apology and A Salute to "The Stash"